Re-printed by Global Genealogy in 1999, ISBN 1-894378-28-8, page 355.
from a Wright family history, written by Mr. Grant Carr-Harris. Mrs. Wall has also contributed some early photos -- see posting on this web page dated February 23, 2010. Text source: Ottawa, the Capital of Canada, by Shirley E. Woods, page 29.
of favourable shoreline. 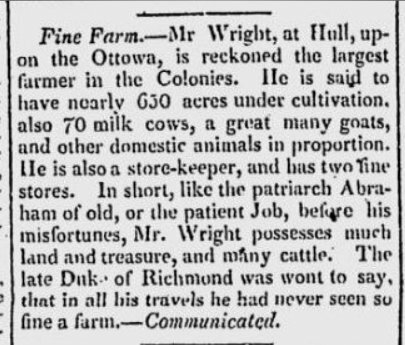 Philemon Wright established a Utopian agricultural settlement. His group were the first permanent settlers in the Ottawa area. haven't found any proof as yet. Source: Posting to UOVGEN by Norma on October 31, 2002. WRIGHT the founder of the Colony (Woburn, Mass) who came to Hull in 1800.
any of my data that might be useful. add your e-mail address as a contact. By and Isaac Firth. I hope to write this up one of these days. Do you know anything about this incident? don't have your original posting). Province of Quebec and part of what is now called the National Capital Region." advantage of the frozen rivers where no roads existed. Along the way they met an Indian who assumed leadership of the ice testing detail. not, however, without adopting Wright as a brother chief! I hope this information is of use to you. I've got to go rake leaves! Note: Nancy also sent along some history of the Reverend Asa Meech (Meech Lake). my father-in-law's papers, so went delving and came up with "Aylmer - Its Heritage". of inexpensive farm land, other settlers arrived soon after." of the 174 pages covering photos and write-ups of the buildings, etc. The names of many settlers are mentioned. 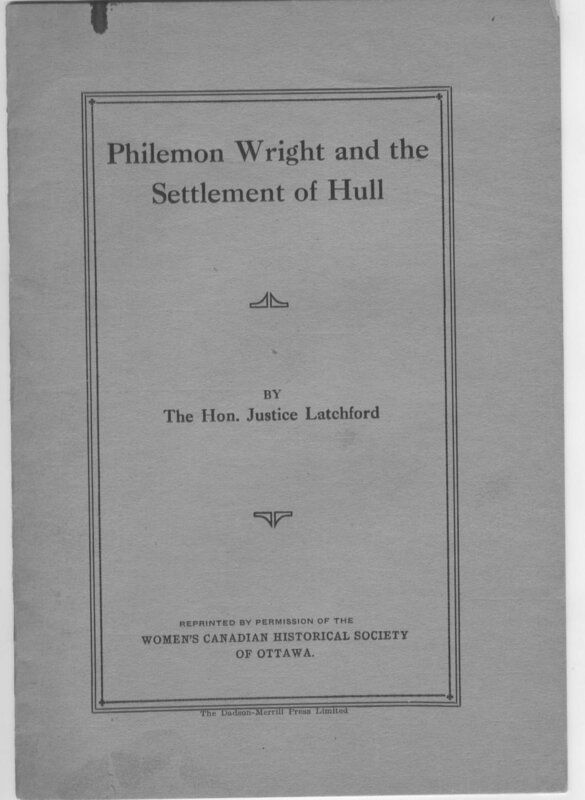 I am a great great (don't know how many greats) grandaughter of Philemon Wright. Hull Quebec. Philoman and Tiberius are marker #27. PS there is a family tree book out there. My uncle has it but he isn't sharing!!! may be a copy of this book in the National Archives in Ottawa. Branch on Metcalfe St. at Laurier Avenue. working in the Ottawa Public Library. See also the CHAMBERLIN brothers who came to work with Philemon Wright in 1819. Theodore Davis, died at the home of Ruggles Wright in Hull, Quebec on March 16, 1841. The death notice was posted in the Christian Guardian. He was 65 when he died. travelled from his home in St. Andrews, Argenteuil, Quebec to Hull to visit Ruggles. Were they longtime friends? Had they met through business? to take advantage of the free land being offered. information, it must keep you busy. will be likely some time down the road. looking for, but if not let me know, I could probably help you out. Grant Carr-Harris, but I believe there have been updates or new ones done. in his research and I'm interested in finding out about that! I'd love to have updated info. for that. Thank you so much in advance for your help. that you could provide me with. he brought with him. Can you help me? Joseph is my brick wall. of Philemon and Theodore as deputies to the Legislative Assembly for Ottawa County 1830-1834.
being a decendant of Philemon Wright. I would like to hear from anyone out there. "Until 1800, Elias Smith had been a Baptist Minister in Woburn, Massachusetts. of the Second Great Revival, a religious fervour which swept the Christian world. my great grandfather was Ernest Howard and my Grandfather was Edgar Athol Wright Sr.
Patrick M.O. Evans, very interesting. improve and expand on the database and content will be appreciated. I was particularly interested in Nancy Meech’s comments on this web site. who came to Hull  with Philemon  on the great migration from the U.S.
to my family. Elisha Sheffield and Polly settled on this Land Grant of 100 acres. There first house was log and the present one in the article was built about 1850.
for his cattle. Does this information fit with any that you may have. My ancestor Harvey Parker travelled with Philemon Wright. back in the U.S. I have made a few connections but can't cofirm them. I am Bob Moody from Vancouver. through the marriage of Truman's daughter Roxanne and Martin Ebert. the the Waller and Ebert families as well as other related families. out to Vancouver in the 1880s. this census is the information pertaining to the Wright families. size and make up of the Ruggles and Tiberius Families that puzzles me. age of 18 and 25 and 17 being single males between the ages of 25 and 40.
families that are described as being led by Philemon to Ottawa around 1800. Can you shed some light on this? Who were all these single men? Ottawa is named after the Truman Waller family? many aspects of the local economy, including lumbering and construction. For example,hey built the bridge and locks at Hog's Back for Colonel By. Another contractor had tried and failed at this project before. Eardley and Onslow and an 1825 population (census) list for Hull Township. 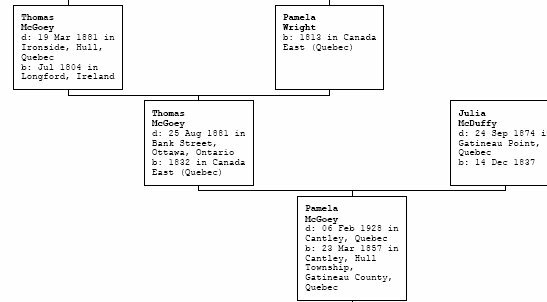 of the Ontario Genealogical Society). is of interest to you. I also read your second Email. also look for other info that may be of interest. by the researchers I met on line from Pontiac County and in the US. honestly don't know if Truman was part of Philemon's group. I do know that Truman is from Connecticut. He was born in Danbury Conn.
family tree information I have received about the Waller family. a Martin Moore. It also shows Martin Moores father as a Dudley Moore. on the militia list as he was probably too old about 48 in 1808. Eliad Waller marrying Abigail Moore a daughter of Dudley Moore Senior. I just haven't had time to look at them all. in the use of  the (?) river. of the transportion into public hands. The most immediate change was made by the timber and lumber industry opening up. the Gatineau River. This was the first timber from the Ottawa. Quebec City after much labour in 35 days. where winds from all quarters had full play. a long heavy oar for him to cling to when it struck his head causing him to sink. had the right of way. by force a large raft belonging to Philemon Wright. There were 50 men in the raft crew (and two small cannons). "The action was not without bloodshed." Tiberius Wright captained the raft. including some that moved to Ottawa. Cooke, Wright to name a few. great grandfather and great he was!!!! I am tardy reading your Sept.'04 posting regarding Elisha Sheffield. The little info. b.1810 - d. Mar.20, 1899 married an Elisha Sheffield Jr. b. Oct.29, 1818 - d. 1907.
and Harriet (no dates). In turn, that Elisha had a son, Elisha IV (no dates). “Parker, Harvey, came with Philemon Wright, in 1800 so far as can be learned. residing a son of Harvey, jr.
wife was born in 1785, and died in 1821.
shore of the Ottawa River. Thanks for your e-mail regarding your ancestors in the Hull / Ottawa area. the first area to be settled in our region. contact for other researchers. Please let me know if this would be OK with you. and so will be maintained in the future. Frank Latchford has contributed more information and a photo of James Culhane Latchford. In 1857, a construction accident occurred at Britannia Farm on the Aylmer Road. Historical Society of Ottawa. Frank Latchford has a copy of this rare 15 page document. 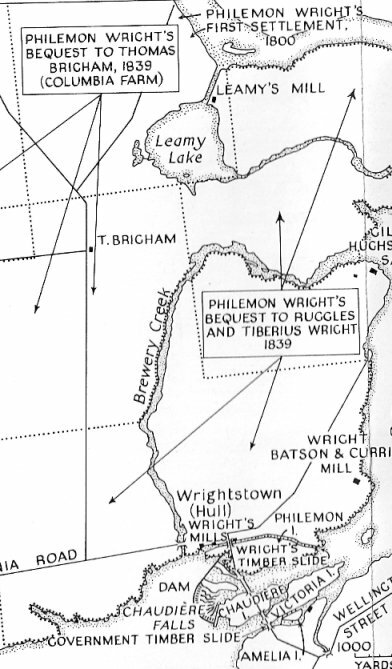 The subject of this speech is the early settlement of Hull by Philemon Wright ( PW ). would join the settlement in Hull, Quebec, founded by Philemon Write in 1800. Thanks for this, Karen ! I saw your email on bytown.net website regarding the couple in the subject line. You stated in your email that you have 'quite a bit of information' on this family. one of them was George Routliffe and one of the 35 other men was John Snow. Library and Archives would not let me photocopy these letters. marry John Snow I mentioned above. to Barbara mentioned above, who married John Snow. that traveled from England to here with George Routliffe and John Snow. to Ruggles Wright at Thread Needle Street, England. The Library and Archives marked it #637. Anson Gard, 1906.  pp. 18, 38, 55, 62, 293, 294, 315, 344 and 367.
and was able to transcribe the letter. I have included it below. Letter # 637 from Westleigh March 25, 1816 Sir, Upon the receipt of yours of 20th inst. These 4 engage for 2 years, at 45 pounds per annum. usually given in the country. the men I can vouch no further. wished to go with you but I had before engaged Calvin Radmore. His wages 36 pds. may some of your Friend. several intend going out passengers in the same vessel, but I know nothing of —. be a credit to themselves and their country. rate of 35 pounds per annum. He was working for Philemon Wright and Sons. other boats that will take them and their freight up the Ottawa to the Hull settlement. Philosophical Society, in North Yorkshire, England, founded in 1823.
find information on most of these men but not the name of the ship they traveled on. of the ship. (for it might say who else was on the ship). Do you know from where in England George Routliffe came from? Do you know the name of the ship he traveled upon to get Canada? Sorry for being so lengthy. Al, you may post this on your site if you wish. the Ottawa. It was printed in 1903, and I have an original copy. ISBN 978-1-897405-13-0. This CD is searchable and can be found in the OGS Library. 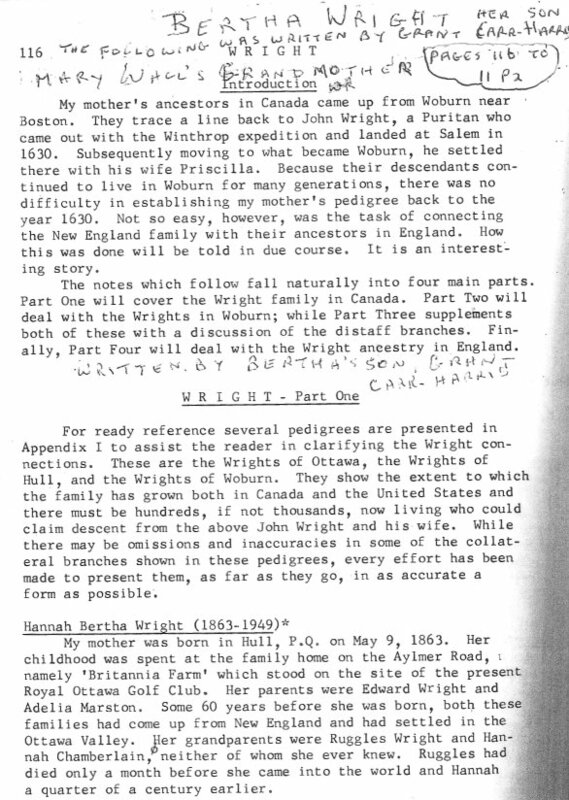 Bertha was born Hannah Bertha Wright to Edward Van Cortland Wright and Frances Adelia Marsten. She married Robert Carr-Harris in 1896 and died in 1949. I have condensed the data, for to type it all would make this email 10x as long. who had been sent by his father to the Mother Land to dispose of two cargoes of timber. table he gave an account of his travels. apparently oblivious of our perilous condition. refused for a long time to help him out of his difficulties. bordered on that of General Wolfe." but Napoleon is now safe at St. Helena, where he was sent last October." "...I have the greatest admiration for Napoleon Bonaparte(2)," said Rug. "Did you see anything of poor Josephine (Bonaparte's wife) ?" asked Abbie. home, 'Malmaison' while we were in Paris." not ceased to protest against a sea voyage from the time they left Liverpool. "And who nearly turned mutineers"
"How was that?" asked Philemon. of the sailors and drank some salt water, which acted as an emetic, and I soon felt better. violent motion of the ship, for there was a perfect gale blowing from the north-west. away our mainyard and rigging, and that we were on our way back to Bristol to refit!! to everything on which they happened to fall. about 200 yards distant. It was almost half a mile in length, and was moving south-east. Soon after we found the channel between Cape Breton and Cape Ray, and got into the ice. he sold at an extortionate price to the passengers. him with over $100,000. " I believe. also, It was Nicholas Sparks that arrived on the Dorris in 1818...I believe. (3) After all, Philemon, Abbie (Ruggles sister), Ruggles and Hannah were all Americans. (5) Diary of Rev. Robert Bell and letters of R. Wright. know is if his body was ever recovered. Al, you may post this on your site if you like. Philemon and right through to my great gand children. haven't had the time. I know they are there, maybe some one in ottawa can drag them out. I would love to see them. i enjoyed this site and had read most of the history. descendants on your site, and I'm hoping one of them will pick up on this request. was born in 1773, but I don't have the exact date, and I don't know who his parents were. what  became known as the Allen Farm on (Hwy 148 I think, Quebec side). I will gladly help out anyone researching the Wyman and Allen lines. as what I am trying to do is trace down her line to present day descendants. The Hannah Allen I'm looking for was born to William Allen (1840-  ) and Edith Lenora Moore. William Allen was a son of Ruggles Allen (1811 -  ) and Mary Routliffe. here with Philemon Wright party. grandfather x5. I descend through his daughter Barbara Allen. about his life in Woburn, Mass. how, so I can add that info to my family tree. So , I'm looking to find out if Hannah Allen married, and if so, to whom. I would be very happy to know. Thanks to Joan Rooney for the following ! son of Thomas than yours. 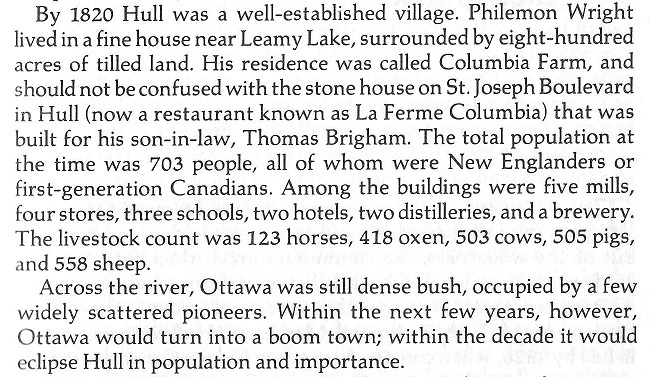 the lumber trade in 1806 in the Ottawa area. Here is an 1835 record of Pamela Wright from Notre Dame Cathedral on Sussex Drive. 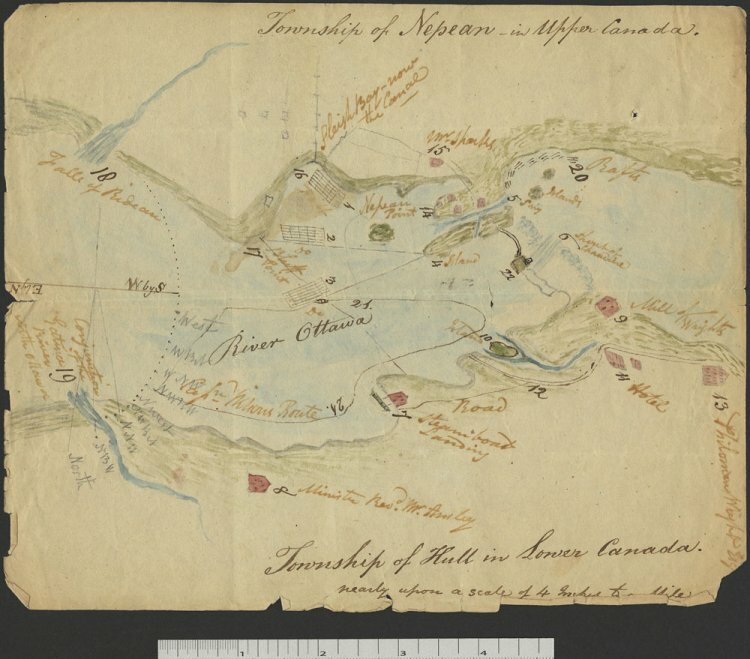 the Township of Hull" by P. Wright Esq., Delivered to the House of Assembly on Dec 16th, 1820. Found a hard copy while doing a little cleaning files. I came across all this recent activity. and I as you can see -now in Mexico. 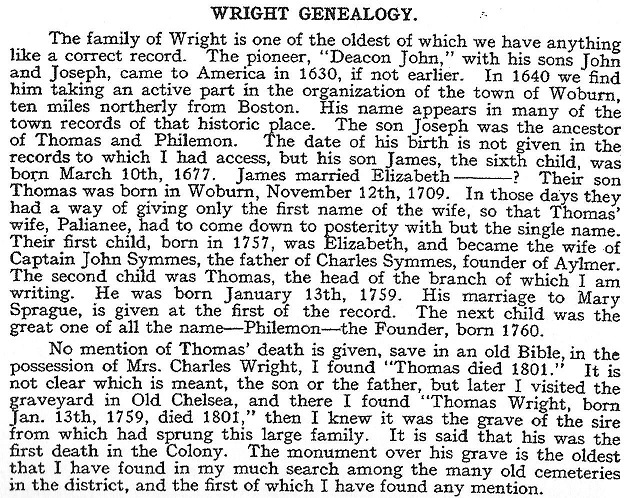 His Father- George Wright- descendents of Philemon. Is there a blog of this info.? wintering here for some years. We will meet when they return in November. How small the world ! of the Hull / Ottawa area. my aunt and became my uncle! My name is Karen Prytula and Philemon Wright's grandfather James Wright is my great grandfatherx8. I descend from several generations later. marriage made him an uncle of mine as well. Courtland Wright. I was filing away a pic of her headstone and some newspaper clippings. She was an author of mostly poetry, and married a Robert Carr-Harris in 1896.
of Assembly on Dec 16th, 1820. Found a hard copy while doing a little cleaning files. copy of what they had. Mine is typed. occupation of farmering and grazing." made a report to the public nearly as follows......."
then burnt, and sown with spring wheat or other seeds, which is a great saving to the farmer." Al, you may put this info on your website. Yep- 13 (maybe 14) pages - not 7. A few comments in red - below. finds it first please let us know. It would take me forever to type it. married Lavine Wyman on 29 Nov 1794. I have Lavine Wyman's younger sister Abigail Wyman born Woburn, Mass. John has also contributed the names of some of the early Hull pioneers who are buried in the Bellevue Cemetery on the Aylmer Road. meet her briefly before she died sometime in the early 50s in Ottawa. history in Canada including most of the Wright geneology. I have 2 charming old photographs of her, one when she was a young successful author. time to her family. The other photo is of her in old age. By the way, have you come across the " 'Account of the first Settlement of the Township of Hull"
vol. 3, Sept.. 1824. I wonder if this article still exists?!!! Please get in touch with me at the above e-mail address if I can be of any further help. Thanks to Mrs. Mary Wall for the following wonderful photos. 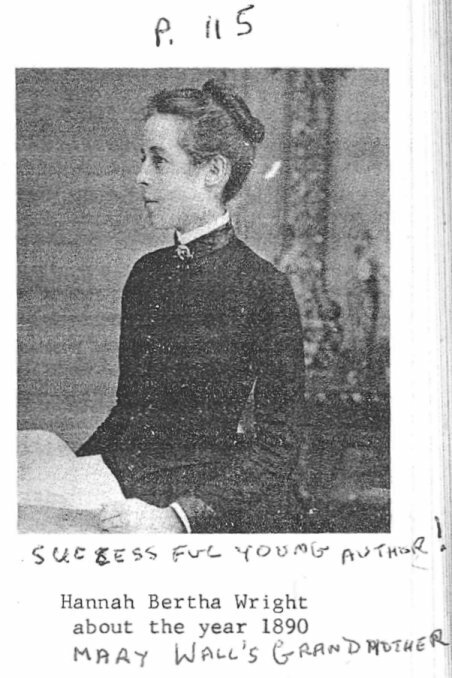 On the left is Hannah Bertha Wright, a successful young author, c. 1890. On the right was the home of Mr. Edward Wright, grandson of Philemon Wright and was part of "Britannia Farm". It is now on the site of the Royal Ottawa Golf Club. New e-mail address for Mary Wall is cramwall@shaw.ca -- incorporated in the list below. Came across this article from the Colonial Advocate in 1824, thought you'd like it. show the earliest dates of the arrival of many of the families to the Ottawa area and Eastern Ontario. Philemon Wright in the early 1800's. Some very early Ottawa/Hull people are listed here. I believe that the early Barber family may have been connected to Philemon Wright's settlement.